Today was a great day of collaborative professional learning at Elk Grove High School! It was an In-Service day intended to give staff time to enhance their knowledge of technology to transform student learning. 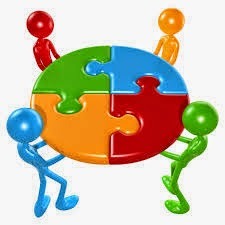 To take advantage of this opportunity, our Collab Lab team facilitated Spark Sessions and EdCamp-style workshops, that teachers could opt to join in on, to build connections and multiply our learning. This portion of the In-Service day was completely teacher-led. The Spark Sessions were led by 10 staff from various disciplines. They each gave a 3-5 minute presentation on an educational technology strategy they use in their classrooms. These sessions were designed to quickly share many examples, learn, and spark ideas for more in-depth learning in the EdCamp Workshops. This was the first time we had EdCamp-style workshops at Elk Grove High School, so we first explained the concept of EdCamps. We then invited staff to propose workshops related to interests, passions, or questions they have. They wrote their ideas on PostIt Notes which a team of teachers used to build the schedule. After just ten minutes working on the schedule, we were ready to go! Check out the schedule of Spark Sessions and EdCamp Workshops in the Google Doc we created and shared with staff with a tiny URL: http://tinyurl.com/eg1to1 . We created this doc to not just to share the schedule with staff but resources as well. 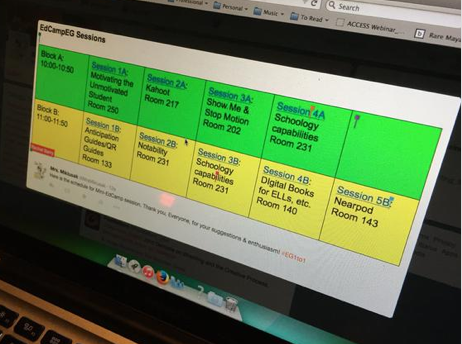 You will notice that the EdCamp schedule includes links to separate Google Docs for each Workshop to curate our learning and resources. Teachers can refer back to the docs to access resources, or learn from the notes on sessions that they did not attend. Did you participate in the day at EG? Have you participated in a similar professional learning experience in another school? Do your have resources or ideas to share? Please leave us comments so that we can extend our learning even more!